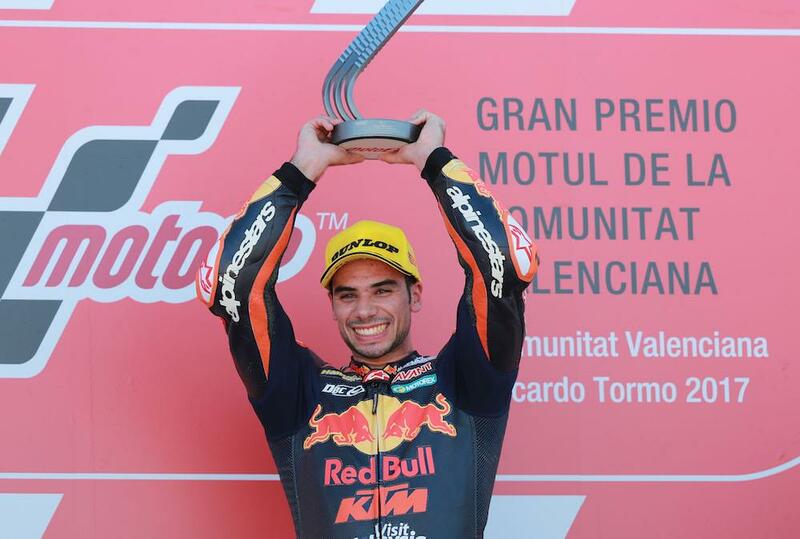 Miguel Oliveira made it three victories from three starts with a sublime victory in the final Moto2 race of the 2017 season. It wasn’t an easy win for the Red Bull KTM rider, as world champion Franco Morbidelli stretched out a two second lead in the early stages. Fighting through from third, Oliveira barged his way past the second Marc VDS machine of Alex Marquez before reeling in the champion and barging his way past. The KTM’s advantage was clear as soon as he passed Morbidelli, the Portuguese rider stretching out half a second within a single lap. He’d eventually take the win by 2.1 seconds over the 2017 champion while the second KTM of Brad Binder completed the podium with his third rostrum in as many races. Sky Racing VR46 rider Francesco Bagnaia finished fourth ahead of Alex Marquez, who dropped back from the podium fight in the latter stages of the race, with Malaysian Hafizh Syahrin completing the top six. 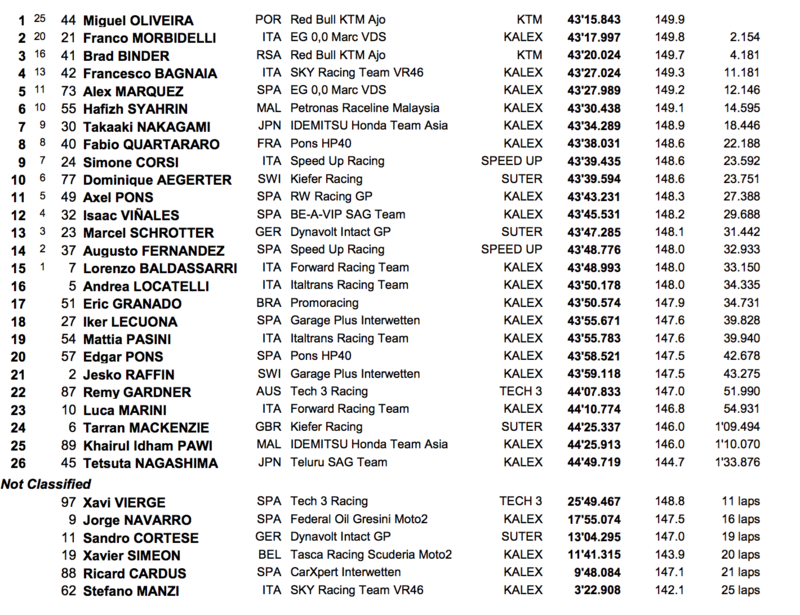 Takaaki Nakagami was seventh ahead of Fabio Quartararo while Simoni Corsi and Dominque Aegerter rounded out the top ten. Britain’s Tarran Mackenzie finished 24th in his final Moto2 race before heading to the British Superbike Championship, while wildcard Jake Dixon didn’t start the race after sustaining bruising to his back in a heavy crash in FP3. Morbidelli’s final championship lead sat at 65 points over the absent Thomas Luthi, with Oliveira third and looking promising for 2018.